Wanting your show horse to have a healthy, sleek coat for show season? Try First Companion What Germ Oil from Lochte Feed & General Store. First Companion Wheat Germ Oil Blend is an excellent energy source and fatty acid supplement for horses of all classes. • Essential fatty acids in a concentrated form. • Provides essential nutrition for hair and coat maintenance. • Pure ingredients to ensure freshness. Horses 1000 lbs, feed 2 to 4 ounces daily mixed with normal feed ration. 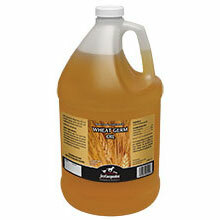 As a general rule of good feeding practice, Wheat Germ Oil should be introduced gradually. Amount and frequency may be varied as necessary or, as directed by a veterinarian. This entry was posted on Wednesday, August 27th, 2014 at 1:31 pm	and is filed under News & Updates. You can follow any responses to this entry through the RSS 2.0 feed. Both comments and pings are currently closed.